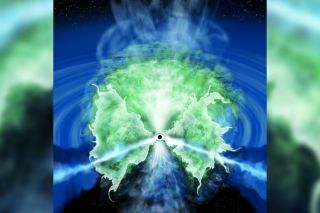 This artistic impression shows the gas motion around the supermassive black hole in the center of the Circinus galaxy. There are churning, hellish, hot-and-cold gas storms swirling around our universe's supermassive black holes. But the scientists who discovered them would prefer you call them "fountains." That's a change from "donuts," the term researchers previously used to describe the roiling masses. But a paper published Oct. 30 in The Astrophysical Journal reveals that the donut model of the mass around black holes may have been too simplistic. But there are better telescopes now, producing better images of those clouds. And it turns out that the situation is a lot more complicated than previously thought. It turns out that, more than anything else, the clouds of matter around black holes more closely resemble fountains like this one, with rings of arching water surrounding inner columns of matter shooting straight into the air. The matter around supermassive black holes seems to move in a pattern that more resembles a fountain than a donut. When astronomers turned the superprecise eye of the Atacama Large Millimeter Array (ALMA) observatory on the the supermassive black hole in the Circinus galaxy, 14 million light-years from Earth in the direction of the southern Circinus constellation, they were able to observe its surrounding cloud in unprecedented detail. A constant stream of relatively cold gas does fall toward the black hole, the observations showed, and some of it gets superheated and is then thrown away from the black holes out into space. Some of that gas, still in the thrall of the black hole's gravity, curves back around and re-enters the falling stream. Some of the gas shoots out in a more or less straight line into space. The whole mess is a lot less orderly than a fountain, but the analogy makes sense. Also, the disk of circling matter looks as thick as it does because it gets stripped from molecules into bare atoms as it approaches the black hole, according to the research. Those more lightweight atoms rebound farther into space, creating a fatter disk.